Why Our Residential Treatment Is So Effective. Our Research. The Discovery Ranch Program can make a difference in your son’s life. We know we can make a difference. We have done the research. Our research centers around a patented testing tool called the Youth-Outcome Questionnaire (Y-OQ). The Y-OQ is a powerful tool that lets us track teen’s problem behaviors. With the Y-OQ, we can target behaviors that need to change, and also measure improvement. The Y-OQ looks at six different kinds of behaviors found in troubled teens and places them on a scale. This is a vital step in helping your son. When you measure problem behaviors, you can approach them in a targeted way. When you see improvements in your son’s Y-OQ score, you can be confident that his behavior is improving. Intrapersonal Distress (ID): The ID scale measures levels of emotional distress. Symptoms of emotional distress include anxiety, depression, and self-harm. Somatic (S): The S scale measures perceived physical wellness. Examples of this type of problem would be headaches, dizziness, and pain or weakness in joints. Interpersonal Relations (IR): The IR scale represents relationships with other people. A teen’s level of aggression, defiance, and ability to make and maintain friendships are aspects of IR. Social Problems (SP): The SP scale measures tendency to break social rules. This could be exemplified by behaviors like destruction of property, substance abuse, and inappropriate sexual behavior. Behavioral Dysfunction (BD): The BD scale measures ability to organize tasks. The types of behaviors measured include the ability to complete schoolwork assignments, concentrate, and handle frustrating situations. Critical Items (CI): This scale attempts to identify behaviors that may need immediate intervention beyond standard outpatient treatment, such as day treatment or residential care. Behaviors that may require immediate intervention include obsessive-compulsive behaviors, suicidal thoughts or behaviors, and eating disorders. In the event that your son receives a high score in any part of CI, he may need immediate help. Higher scores on the Y-OQ represent higher levels of dysfunction. Lower Y-OQ scores mean that teens are better able to lead happy, productive lives. As your son’s behavior improves, you can expect to see his Y-OQ score become lower. In order for the Y-OQ to be meaningful to you, you need to be confident that the Y-OQ will measure your son’s progress objectively. That is why a third party conducts our Y-OQ assessments. 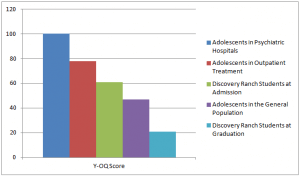 The graph below compares the average Y-OQ score to Discovery Ranch graduates to the average score of students at admission, adolescents undergoing other forms of treatment, and the general population. Teens who graduate from Discovery Ranch demonstrate fewer problem behaviors than they had before they joined our program. They even have fewer problem behaviors than teens in the general population. Discovery Ranch graduates also maintain these improved behaviors long after graduation. In conclusion, our results show the Discovery Ranch program can decrease the level of problem behaviors. When your son’s behavior improves, he has the opportunity to succeed and your family’s relationships the opportunity to heal.